A plan to invest €1.2 billion in Irish culture, heritage and language infrastructure has been unveiled by the Government of the Republic of Ireland. As part of Project Ireland 2040, the ten-year programme will see €460million allocated to National Cultural Institutions; €265million towards cultural and creativity investment; €285million for natural and built heritage; and €178million for the Gaeltacht, the Irish language and the Islands. Among the priority projects within the programme are renovations at the National Library of Ireland (€23m) and National Archives of Ireland (€22m). For Irish family historians, perhaps the most intriguing mention is a €10m allocation within the cultural and creativity package for 'digitisation of national collections'. The plan states 'Some projects which should be available online in the short-term include ... Church Records, which consist of parish registers for baptism, marriage and burial'. With images and indexes of the National Library's collection of Roman Catholic registers already online, dare we assume the records alluded to will be Church of Ireland registers? 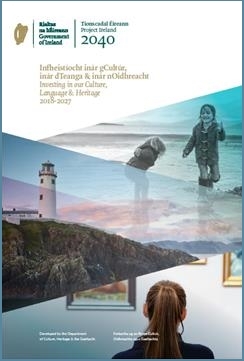 For more details, click the image above to download the 36-page Investing in Our Culture, Language and Heritage 2018 – 2027 (pdf 18.1Mb).